Here is a great resource for Upper Key Stage 2 teachers who want to do cross-curricular work based around the Alfred Noyes’ poem ‘The Highwayman’. 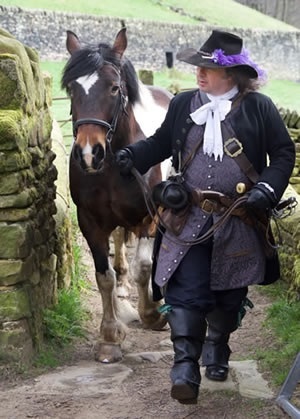 My own character, John Nevison, features in the video, as I spent a lovely day in the countryside near Marsden for the filming. The link in the article below is www.teachthehighwayman.co.uk (if you want to go straight there!). The Milestone Society has created an exciting new website around the topic of The Highwayman by Alfred Noyes. The website contains accessible, fun resources aimed at upper Key Stage 2 and can be delivered as part of a topic based around the poem or as individual lessons that link to aspects of history, geography, outdoor learning and much more. The poem by Alfred Noyes forms a starting point for pupil investigations, further developed into lessons covering topics such as travel and transport, old maps, waymarking, milestones and imperial distance measurement. There is also a video of a Highwayman finding his way which can be used as a support resource. “The Highwayman” concept has been developed by Jan Scrine of The Milestone Society from an original idea by Alison Farley. The educational resources have been devised by Mairi McLeod of CASE Education. Thank you for your time, we welcome your comments and feedback on our new website and resources. It’s been a long time since I posted a news story, but that’s mainly because I have been too busy visiting schools to find the time to write about visiting them!